In the New York Times Book Review cover story yesterday, the 42nd president offered his assessment of a biography of the 36th president. It's not often that a former president reviews a book, but The Passage of Power is no ordinary book. 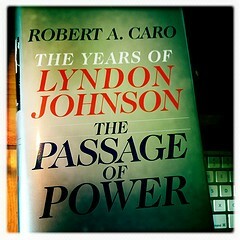 It's the fourth volume of Robert A. Caro's epic biography of Lyndon Johnson. Caro is the Michael Jordan of historians. (NBA fans often called Jordan the Bob Caro of basketball. Or could have.) Caro's three previous LBJ volumes, plus his 1975 biography of Robert Moses, The Power Broker, have, in all, won two Pulitzer Prizes in biography, two National Book Critics Circle Awards, and a National Book Award. In 2010, President Obama awarded Caro the National Humanities Medal. So it's not surprising that Bill Clinton found The Passage of Power to be "fascinating and meticulous." The book covers LBJ's futile attempt, between 1958 and 1960, to win the Democratic presidential nomination, his powerless years as vice president, and his sudden return to power with the assassination of John F. Kennedy on November 22, 1963; but nearly half of the 712 pages are on the seven weeks between the assassination and Johnson's State of the Union address on January 8, 1964. Clinton was particularly intrigued by Caro's account of those seven weeks, of how deftly LBJ navigated bills out of legislative committees—including the bill that became the 1964 Civil Rights Act—and how skillfully he laid the foundation for a war on poverty, which he declared in that State of the Union address. An ally had warned Johnson against taking on either of these "hopeless" causes. "That neither of these causes was in fact hopeless was clear possibly only to him," Clinton wrote in yesterday's review, "as few Americans in our history have matched Johnson’s knowledge of how to move legislation, and legislators." I'm reading The Passage of Power, and I'll be referring to it here in weeks to come—particularly to what it reveals about the genesis of that war on poverty. I've written in recent Reader posts that despite a steady rise in poverty over the last decade, and despite an extraordinary poverty incidence of 38 percent among African-American children, poverty has been ignored thus far in our current presidential race. But first, today, a disclosure: While I agree with Clinton that Caro has "done America a great service" through his writing, I also have a personal reason to be grateful to him. A recommendation from Caro allowed me to write a book of my own. He read a story of mine—a 1988 Reader feature about a young west-side woman who died in a fire saving two of her children—and liked it enough to recommend me to his publisher, Knopf. That led to a contract and a book on Chicago's felony courthouse, published by Knopf in 2005. While I was working on the book—struggling with it at times—Caro offered me his guidance and encouragement. So I'm familiar not only with his work but also his generosity. My book's publication was briefly delayed because of another Knopf book—written by the author of yesterday's Times review. When I turned in my manuscript in 2003, my editor, Katherine Hourigan, who's also the managing editor at Knopf, let me know that she had one "special project" to complete before she could get to my manuscript. The special project was Clinton's autobiography, My Life. I was honored to have my book delayed by a former president's. Clinton and Caro have shared the same legendary editor, Robert Gottlieb. A former editor in chief of Knopf and former editor of the New Yorker, Gottlieb has been the Muhammad Ali of editing—gifted, and not unaware of his talents. "I have fixed more sentences than most people have read in their lives," he once told the Paris Review. When Clinton met Gottlieb after signing the contract for My Life , the former president said to the editor, "I'm so glad you're working for me, Bob." To which Gottlieb reputedly responded, "No, Bill—you're working for me." Gottlieb and Caro have been a team since Gottlieb began editing The Power Broker in the early 1970s. (Gottlieb cut more than 300,000 of the million-plus words in Caro's manuscript so it could be published as one book.) Now Gottlieb is 80 and Caro 76, and though both are healthy, there's concern about the two finishing what Caro promises (again) will be the final volume of his Lyndon Johnson history. The Passage of Power took ten years. In 2002 Caro nearly died from pancreatitis. "I don't like to think about that," he recently told Esquire. "Then I might feel like I have to rush. I don't want to rush." In his acknowledgments in The Passage of Power, Caro notes that during his 42 years of working on books for Knopf, no one at the publishing house has ever pressured him to finish. No one, in fact, has so much as asked him when he'd be done with a manuscript. Knopf has shown him "an understanding of what I am trying to do with my books, and an understanding also that it might take a long time to do it." Our editor here at the Reader, Mara Shalhoup, joined us just over a year ago. She's a wonderful editor, but I have to report that in her 14 months with the paper, she's already asked me and my colleagues on more than one occasion when we'd be done with something. And we haven't won a single Pulitzer in those 14 months. So I suggest she try the Knopf-Caro practice with a writer—and I hereby kindly offer myself as the guinea pig. For the next two years or so, Mara, try not asking me when I'm going to finish what I'm working on. If I don't win a Pulitzer in that time, we can return to the fusty deadline method. Dramatic changes in property tax assessment have a deep impact on renters, assessor candidate Fritz Kaegi says. Laverne Williams, 19, died in a fire in her west-side apartment on January 27. She saved her son Derrick, 3, and her daughter Delina, 1, before succumbing. She is survived by her mother Glo, her twin sister Lavette, and a large extended family.